Michelle Murray?s r?sum? speaks volumes about the remarkable progression of her career, but she continues to set lofty goals. Her admiration for top-of-the-line products has led her to work for such high-profile companies as General Mills Inc., Revlon Inc., Kraft Foods Inc. and now Kobrand Corp., where she is brand director of Aliz? Liqueurs & Cognacs. Murray is confident in her abilities and realizes she has yet to reach her pinnacle. ?There are so many more things for me to achieve. The real highlights are yet to come,? she says. ?I am where I am today because of my limitless passion and drive, but my journey is far from over.? Murray inherited a champion spirit from those she considers her role models ? 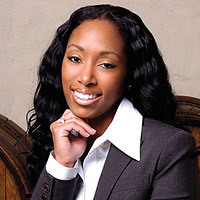 her mother, Velma Clarke, her sister, Christyl Murray, and from Charles Palombini, president and CEO of Kobrand, who handpicked her to spearhead the development of Aliz? ?s brand strategy and marketing communications. Her responsibilities include brand development, advertising and promotions. She manages eight outside agencies, a full-time staff of three marketing professionals and a multimillion-dollar budget. Murray has a bachelor?s degree in business administration from the University of California Berkeley and a master?s in business administration, with specialization in marketing, from Columbia Business School. She is dedicated to her alma mater and participates in ?YES! Berkeley? as an advocate for the university, reaching out to prospective students to encourage and motivate them to attend the prestigious university. Murray is also a member of Alpha Kappa Alpha Sorority Inc. It is not often that someone so young is contented with his or her life. Murray is such an example. If offered unlimited time and money, she would not change a thing, she says. ?I love being a leader, a role model, a daughter, a sister, a devoted friend and most of all I love the feeling of accomplishment that I get every single day. ?